Honey Bourbon Steak Bites are seared in a cast iron pan until charred on the outside but still juicy on the inside. They are both sweet and salty with the wonderful flavor of bourbon. 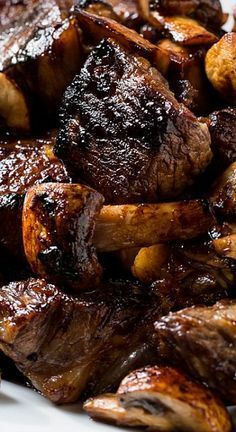 In a medium bowl, whisk together honey, brown sugar, bourbon, soy sauce, Worcestershire sauce, red pepper flakes, and garlic. Pour into a large ziptop bag. Add steak cubes and refrigerate for 2 to 4 hours. Heat vegetable oil and 2 tablespoons butter in a cast iron pan over medium-high heat. Add steak. You will probably need to cook it in two batches because you don't want to crowd the pan. Cook until seared on all sides. Remove from pan. Add remaining butter to pan and cook mushrooms until browned.